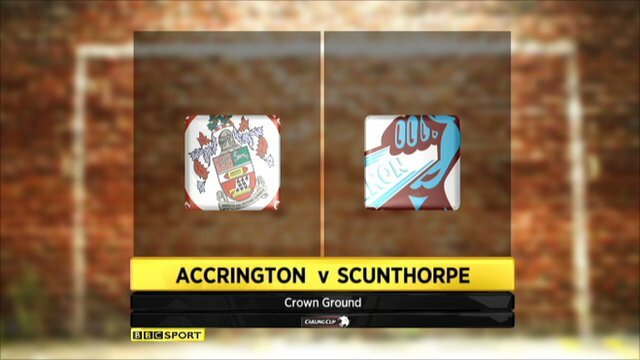 Scunthorpe left it late to beat Accrington and reach the second round of the Carling Cup. With eight minutes left, Kern Miller put in a clumsy challenge on Andy Barcham and Chris Dagnall sent Sean Murdoch the wrong way with his penalty. And Barcham sealed the first round win in injury time on his debut from 25 yards out. Earlier, Stanley's Kevin McIntyre headed the ball off his own post - the best chance before the late strikes. "It was a tough game just as we always thought it was going to be and it was a new experience for some of the players coming to Accrington. "I think the first half can show you what can happen. We could have been comfortably behind and fortunately we weren't. "We had to say a few words at half-time and let the players have faith in themselves and step forward and in the first half I thought we didn't take the game to Accrington and straight from the start of the second half, we did." 90:00+4:07 The referee blows his whistle to end the game. 90:00+2:20 Assist by Jordan Robertson. 90:00+2:20 GOAL - Andy Barcham:Accrington Stanley 0 - 2 Scunthorpe Andy Barcham finds the back of the net with a goal from outside the area to the bottom right corner of the goal. Accrington Stanley 0-2 Scunthorpe. 90:00+1:39 Sam Togwell produces a cross, Sean Murdoch makes a save. 90:00+1:04 Andy Barcham decides to take the corner short. 90:00+0:01 A cross is delivered by Mark Duffy, Kern Miller manages to make a clearance. 89:26 The ball is crossed by Mark Duffy, save by Sean Murdoch. 87:35 Peter Murphy is adjudged to have handled the ball. Indirect free kick taken by Josh Lillis. 85:11 Substitution Jordan Robertson on for Chris Dagnall. 85:11 The referee penalises Andrew Procter for handball. Free kick taken by Josh Lillis. 84:09 Substitution Kurtis Guthrie leaves the field to be replaced by Nathaniel Taylor. 84:09 Substitution Peter Murphy joins the action as a substitute, replacing Charlie Barnett. 84:09 Substitution Sean Hessey on for Craig Lindfield. 83:39 Kevin Long sends in a cross, Josh Lillis makes a save. 82:38 Bobby Grant crosses the ball, Sean Murdoch makes a save. 81:51 GOAL - Chris Dagnall:Accrington Stanley 0 - 1 Scunthorpe Penalty taken right-footed by Chris Dagnall and scored. Accrington Stanley 0-1 Scunthorpe. 81:01 Kern Miller gives away a Penalty for an unfair challenge on Andy Barcham. 80:41 Centre by Bobby Grant. The ball is swung over by Mark Duffy, clearance made by Dean Winnard. 80:06 Mark Duffy sends in a cross, Kevin Long makes a clearance. 78:50 Outswinging corner taken right-footed by Mark Duffy played to the near post, clearance by Charlie Barnett. 77:42 Chris Dagnall decides to take a short corner. 77:27 Dean Winnard crosses the ball, Eddie Nolan makes a clearance. 74:40 Corner taken right-footed by Mark Duffy to the near post, Kevin McIntyre manages to make a clearance. 72:38 Free kick awarded for an unfair challenge on Andy Barcham by Kern Miller. Direct free kick taken by Paul Reid. 71:05 Bobby Grant challenges Andrew Procter unfairly and gives away a free kick. Sean Murdoch restarts play with the free kick. 70:45 The ball is swung over by Mark Duffy, Kevin Long manages to make a clearance. 69:22 Centre by Andrew Wright, Shot from deep inside the area by Chris Dagnall clears the crossbar. 68:32 Corner taken by Mark Duffy played to the near post, Kurtis Guthrie manages to make a clearance. 68:11 Free kick awarded for a foul by Andrew Procter on Bobby Grant. Mark Duffy takes the direct free kick. 67:33 Substitution Bobby Grant on for Garry Thompson. 66:31 Corner taken by Mark Duffy from the right by-line played to the near post, Paul Reid takes a shot. Save made by Sean Murdoch. 66:02 Garry Thompson has a drilled shot. Sean Murdoch makes a save. Corner taken by Mark Duffy, clearance made by Kern Miller. 65:19 Unfair challenge on Kurtis Guthrie by Paul Reid results in a free kick. Sean Murdoch restarts play with the free kick. 64:04 Effort from the edge of the penalty box by Mark Duffy goes wide of the right-hand upright. 62:51 Foul by Kevin Long on Andrew Wright, free kick awarded. Free kick crossed right-footed by Mark Duffy, Dean Winnard makes a clearance. 61:28 The offside flag is raised against Andrew Procter. Free kick taken by Josh Lillis. 60:39 Corner taken right-footed by Charlie Barnett from the right by-line to the near post, Andy Barcham makes a clearance. 59:30 Kevin McIntyre restarts play with the free kick. 59:30 Booking Michael Nelson is booked. 59:26 Michael Nelson concedes a free kick for a foul on Kurtis Guthrie. 57:29 Chris Dagnall gives away a free kick for an unfair challenge on Kevin Long. Direct free kick taken by Sean Murdoch. 55:22 Centre by Eddie Nolan, Kevin McIntyre makes a clearance. Mark Duffy takes the inswinging corner, Charlie Barnett makes a clearance. 54:36 Kurtis Guthrie fouled by Paul Reid, the ref awards a free kick. The free kick is delivered right-footed by Charlie Barnett from right wing, clearance by Michael Nelson. 53:18 The ball is swung over by Mark Duffy. 52:41 Paul Reid fouled by Kurtis Guthrie, the ref awards a free kick. Free kick taken by Michael Collins. 51:29 Kevin Long challenges Chris Dagnall unfairly and gives away a free kick. Mark Duffy has a direct shot on goal from the free kick, save made by Sean Murdoch. 50:34 Michael Collins sends in a cross, clearance made by Craig Lindfield. Chris Dagnall decides to take a short corner, Shot from just outside the box by Mark Duffy goes over the bar. 48:52 The referee penalises Craig Lindfield for handball. Eddie Nolan restarts play with the free kick. Mark Duffy takes a inswinging corner from the left by-line played to the near post, Paul Reid produces a header from inside the area that goes over the crossbar. 48:09 The ball is delivered by Mark Duffy, Kevin McIntyre makes a clearance. 47:40 Short corner worked by Mark Duffy. 45:12 Michael Nelson fouled by Kurtis Guthrie, the ref awards a free kick. Free kick taken by Josh Lillis. 45:01 The referee starts the second half. 45:00+2:15 The referee calls an end to the first half. 41:38 Effort from 25 yards by Eddie Nolan. Save made by Sean Murdoch. 40:29 Kevin Long produces a cross, clearance by Michael Nelson. Outswinging corner taken right-footed by Charlie Barnett from the right by-line. 37:00 Corner taken right-footed by Charlie Barnett, The ball is crossed by Kevin McIntyre, save by Josh Lillis. 36:24 Chris Dagnall gives away a free kick for an unfair challenge on Kern Miller. Dean Winnard takes the free kick. 35:50 Unfair challenge on Kevin Long by Garry Thompson results in a free kick. Sean Murdoch restarts play with the free kick. 35:28 Ian Craney takes a shot. Save by Josh Lillis. 33:49 Centre by Paul Reid. 32:54 Effort from outside the penalty area by Andrew Procter goes wide left of the target. 32:13 Mark Duffy produces a right-footed shot from the edge of the box and misses to the right of the target. 30:53 Header from deep inside the area by Andy Barcham goes harmlessly over the crossbar. 30:13 Corner taken by Michael Collins, A cross is delivered by Mark Duffy. 29:40 Kurtis Guthrie is ruled offside. Free kick taken by Josh Lillis. 29:01 Chris Dagnall gives away a free kick for an unfair challenge on Kevin Long. Free kick taken by Sean Murdoch. 25:57 Garry Thompson is ruled offside. Free kick taken by Sean Murdoch. 25:27 Free kick awarded for an unfair challenge on Andrew Wright by Craig Lindfield. Direct free kick taken by Josh Lillis. 24:22 Shot from just outside the box by Kevin McIntyre goes over the target. 23:03 Corner taken right-footed by Garry Thompson from the right by-line to the near post, Ian Craney manages to make a clearance. 22:00 Free kick awarded for a foul by Ian Craney on Sam Togwell. Paul Reid delivers the ball from the free kick right-footed from left wing, Kern Miller makes a clearance. 20:33 Andy Barcham produces a drilled right-footed shot from 25 yards. Save made by Sean Murdoch. 19:36 Craig Lindfield takes a shot. Josh Lillis makes a save. 18:18 Substitution Andy Barcham is brought on as a substitute for Jimmy Ryan. 16:42 Inswinging corner taken by Mark Duffy. 16:04 The ball is delivered by Ian Craney. 13:12 Eddie Nolan crosses the ball in from the free kick, Craig Lindfield manages to make a clearance. 13:12 Booking Booking for Dean Winnard for unsporting behaviour. 13:01 Foul by Dean Winnard on Jimmy Ryan, free kick awarded. 10:35 Shot from long distance by Luke Joyce misses to the right of the goal. 7:48 The assistant referee flags for offside against Kevin Long. Josh Lillis restarts play with the free kick. 7:13 Luke Joyce crosses the ball, Michael Nelson makes a clearance. 6:57 Charlie Barnett decides to take the corner short. 5:17 Chris Dagnall takes a shot. Save by Sean Murdoch. Outswinging corner taken from the right by-line by Jimmy Ryan, Luke Joyce makes a clearance. 4:20 Unfair challenge on Kern Miller by Chris Dagnall results in a free kick. Sean Murdoch restarts play with the free kick. 3:16 Effort from the edge of the area by Kurtis Guthrie goes wide of the left-hand post. 2:32 Centre by Kurtis Guthrie, clearance by Michael Nelson. Effort on goal by Charlie Barnett from just inside the penalty box goes harmlessly over the target. 1:33 Andrew Procter fouled by Mark Duffy, the ref awards a free kick. Kevin Long takes the direct free kick. 1:24 Dean Winnard sends in a cross, clearance made by Paul Reid. 0:15 Shot by Kurtis Guthrie from 18 yards. Josh Lillis makes a save. 0:00 The referee gets the game started.